Pump Coffee needed a solution for their reverberation concern. Due to our expertise in acoustic solutions we were able to deliver the perfect solution for Pump Coffee. We recommended and installed our premium 100% recyclable Calando Panels. 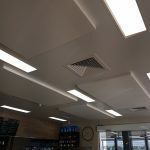 The introduction of the panels addressed Pump’s issue with too much noise in their café, improving uncomfortable experiences and allowing for conversations once again to be held in the cafe. Many of the older customers struggled with the level of reverberation and stopped frequenting the café as it was too hard for them to hear, as a result of the solution, we hope they return. Avenue Interior Systems installed Calando Absorptive Panels on the ceiling and one wall to reduce the excess noise. Our Calando Panel is made from 100% recyclable polyester, is lightweight, semi-rigid, impact resistant and incredibly durable, because of this has high levels of sound absorption while allowing aesthetic appeal for any application. The solution was designed to make sure the ceiling panels blended into the ceiling, as such they were white. The wall panels were brown to match the couches and create a decorative statement. 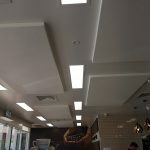 The Panels are our premium sound solution for both wall and ceiling applications. They are engineered for superior sound absorption and balanced acoustic design. We can provide a custom design for each individual client, including an image or design as a detail on the acoustic panel. 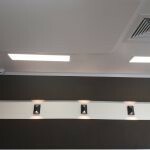 Available for a range of applications, Calando Panels provide high performance acoustics for commercial sound control. Their sophisticated appeal allows for use as office partition paneling, suspended or direct fixed feature for ceilings, wall-coverings and as a decorative feature with custom cut and printing options. To speak to one of our team members, call 1300 827 177, or fill in the Contact Us form and we will be in touch!